It is unclear yet whether the Main Military Prosecutor’s Office had checked whether the criminal case against the former defence minister was filed lawfully, a source says. The investigation in the criminal case against former Russian defence minister Anatoly Serdyukov, who is accused of negligence, is over, and he may be relieved of criminal responsibility within the amnesty campaign to mark the 20th anniversary of Russian Constitution, a reliable source told Itar-Tass on Monday. “The investigation is over. Serdyukov is studying the criminal case files. It is unclear yet whether the Main Military Prosecutor’s Office had checked or had not checked whether the criminal case was opened lawfully,” the reliable source said. In his words, the former defence minister was charged under Article 293 Part 1 of the Russian Criminal Code for negligence that entailed a massive damage. “Upon the end of the investigation the indictment should be submitted in the prosecutor’s office to check its lawfulness, and then it will be passed in the court, which can relieve Serdyukov of criminal responsibility within the amnesty campaign to mark the 20th anniversary of Russian Constitution,” the reliable source said. 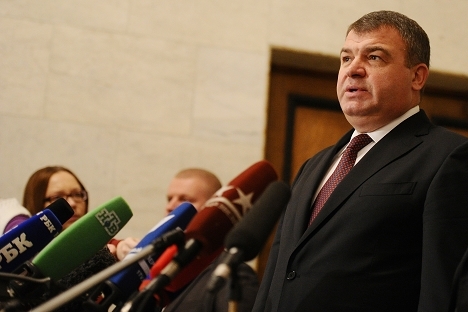 On December 6, Serdyukov faced the official accusation of negligence. The detectives found that the former minister gave oral instructions to his subordinates to build a motor road from the village Krasa in Astrakhan Region to Shkolny Island, on which the non-profit partnership Zhitnoye is situated, from the budget resources of the ministry. Meanwhile, the former minister also instructed to develop the premises of the vacation retreat Zhitnoye. The detectives believe that the Russian state sustained more than 56 million roubles (about $1.7 million) of damages from Serdyukov’s activity. The former defence minister did not plead guilty. Serdyukov was sacked a year ago from his post as defence minister, which he had held since 2007, following a multimillion-dollar embezzlement scandal involving several companies affiliated with the Defence Ministry.